Most of the Sandycove Island Swimming Club were away in London at Tooting Bec Lido for the British Cold Water Swimming Championships at the weekend, living it up in the 1.8° degree Lido water. 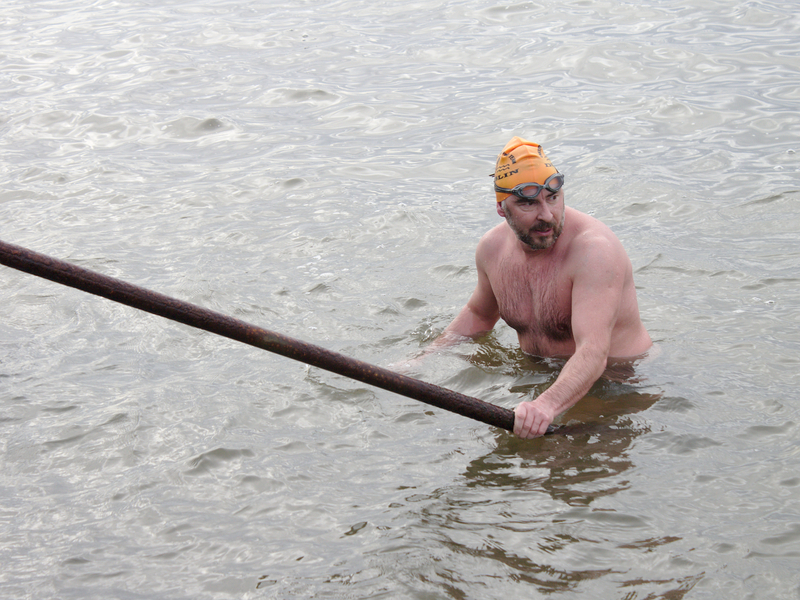 Earlier in the week however, Dublin English Channel soloist, and North Channel Aspirant Fergal Somerville circulated an email from himself and fellow Dublin English Channel soloist John Daly, looking for anyone who was interested in making an official ice-mile attempt in Dublin Bay run by his club, the Eastern Bay Swimming Club. (Anyone that is, who was regularly swimming in cold water and had a good swim record). 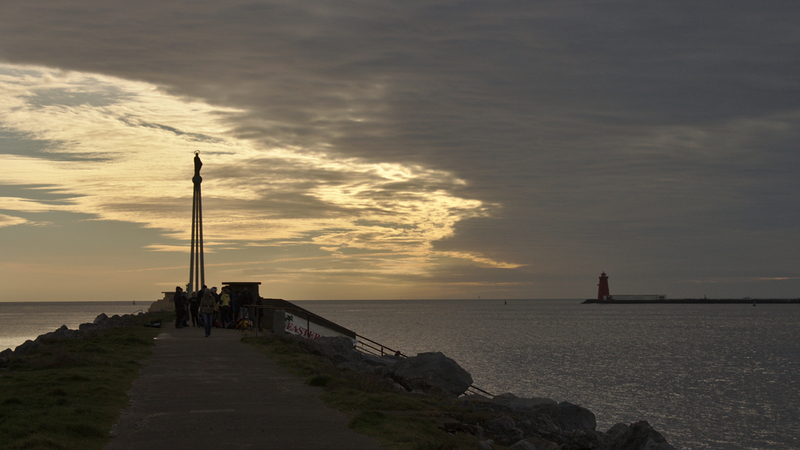 And so it was that six of us assembled, with a veritable army of helpers and Doctors, volunteers, Sea-Scouts and safety crew, film-crew and photographers, well-wishers and looky-loos, at the outermost shelter on Dublin’s Bull Wall in Dublin Bay on Saturday morning. The requirements for an official ice-mile are pretty straight-forward: 1600 metres in water that must measure 5° Celsius or less, verified using three different submerged thermometers, 30 centimetres under the surface. Swimmers swim under English Channel regulations; single cap, goggles and swimsuit, with lubrication sufficient only to protect against chaffing. The swimmers also must provide an ECG taken within 30 days before the swim. The weather was very cold here for the previous two weeks but water temperatures had risen on the south coast. 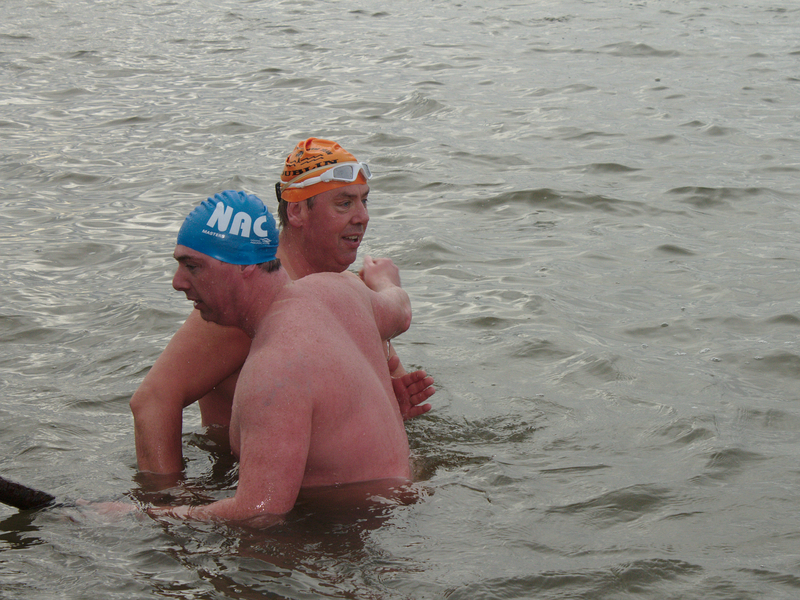 The previous Saturday’s swim at the Guillamenes was 8.6° Celsius, but the east coast of Ireland is always colder, and Fergal and John had measured 4° C the previous Saturday. 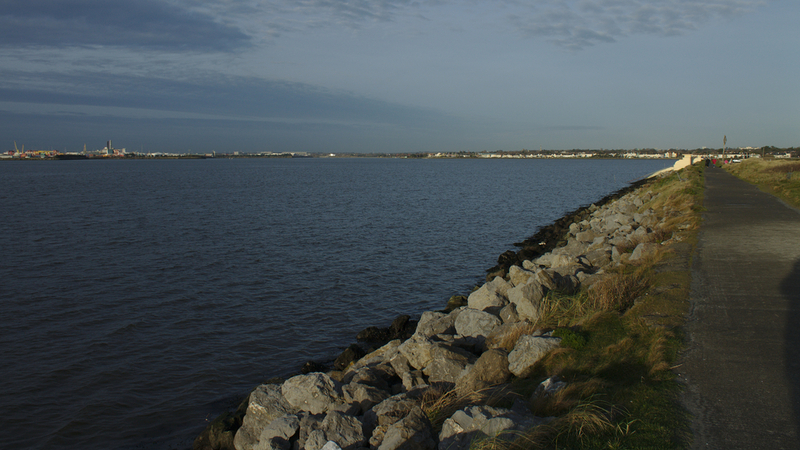 However during the week safety officer and English Channel soloist Ger Carty measured the water at 6° C.
The morning was bright and cloudless on the Bull Wall, which runs from out in Dublin Bay back along north-easterly along Bull Island, marking the northern edge of Dublin Port harbour. 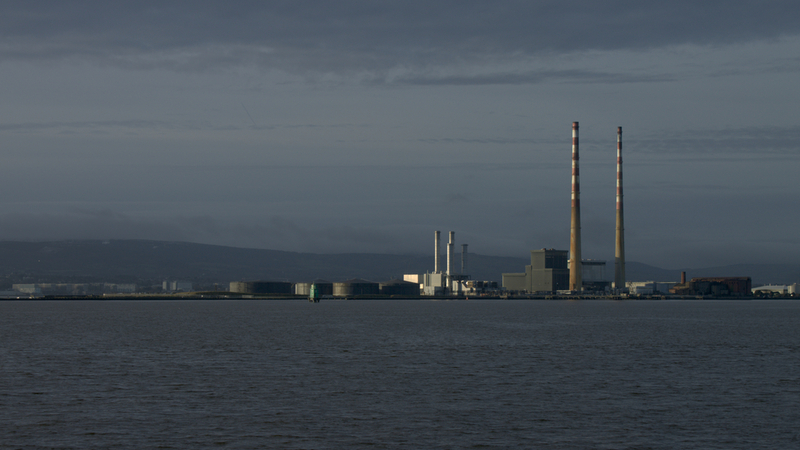 Across the harbour is Dublin Landmark the Pigeonhouse power station. Measurements on Saturday morning indicated a temperature of 7° to 7.2° Celsius, well above the required mark, but there was no thoughts of us not swimming, treating it at least as a training swim. I’d slipped off a rock while taking a photo for my blipfoto account earlier in the week and bruised my ribs and hadn’t been able to swim much in the pool, as I was hurting on tumble-turns, push-offs and backstroke, all aspects of swimming which luckily I didn’t need for open water. I’d eaten enough that morning, and while my night’s sleep was shortish, it should have been sufficient. 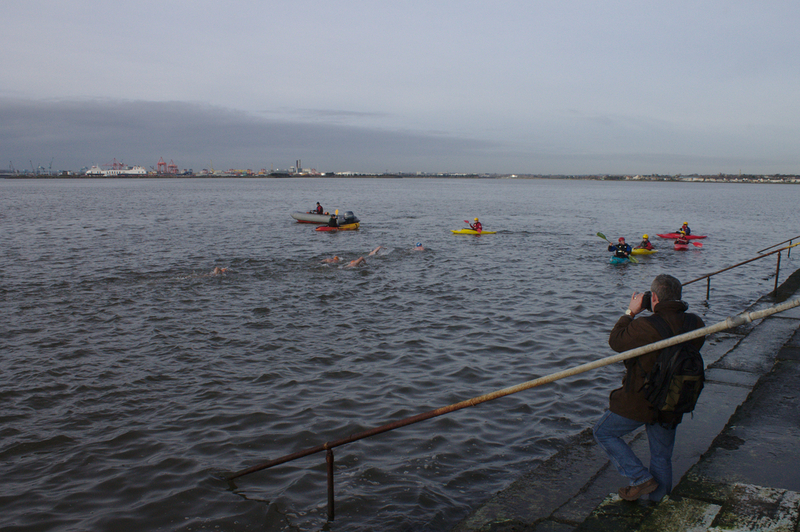 The swim was to be back along the Bull Wall toward the city, to just past the Golf Club. There were plenty of Sea-Scouts on kayaks and a safety boat also, and volunteers walking along the path watching us. The turn was to be just past the Golf Club and indicated by a flag on the wall. 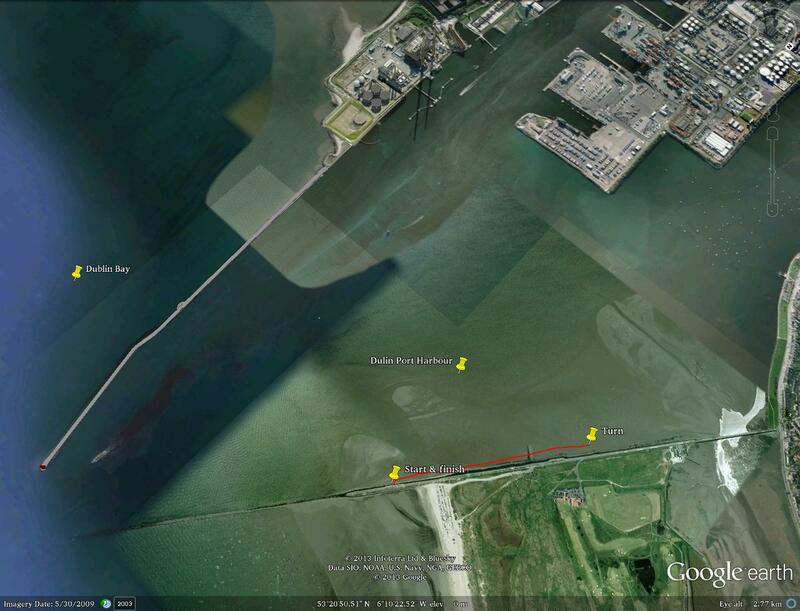 The swim route. Nothing much to see here. At 10am we assembled in the easternmost shelter at the end of the wall to get ready and assembled on the steps at just before 10.10 am. I’d greased slightly under my arms, something I’ve haven’t been doing for my recent swims, I seem to have finally gotten over the need to prevent chaffing for swims under 30 minutes, but I didn’t want any possibility of getting chaffed if I was really cold. 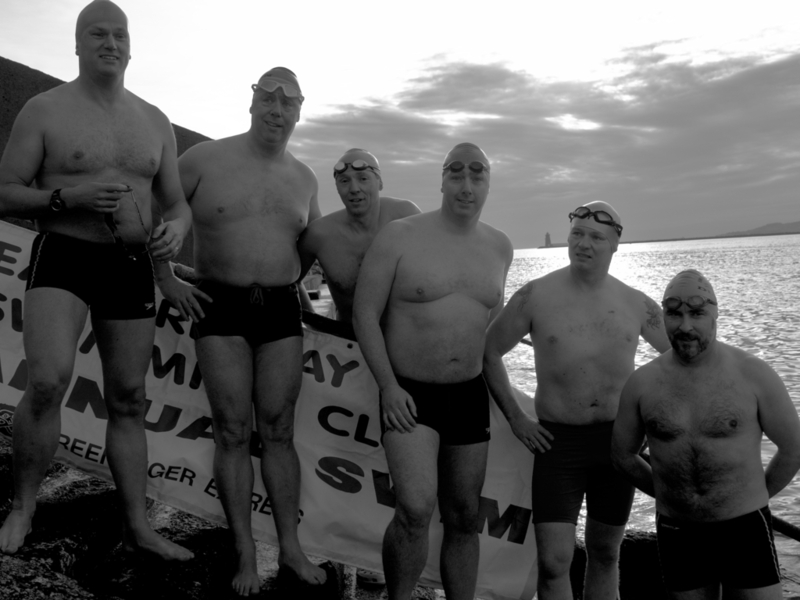 The six swimmers were organisers John and Fergal, myself, Ger Kennedy and Colm Breathnach and Patrick Corkery, (Kennedy being a novice swimmer & only person I didn’t know), but all experienced open water marathon swimmers. We lined up for a photo beforehand, I was on the far side of the railing and struggled to peek out from behind The Wall of Men. A wall of men. Big men. Manly men. What the hell am I doing behind there? From left to right; Colm Breathnach, Fergal Somerville, myself peeking out, Patrick Corkery, novice, John Daly. The water down along the wall was rippley but fairly flat. The air temperature was 4° C but the breeze felt cold and the wind-chill surely dropped the perceived temperature to about zero. I’d been a bit nervous for a couple of hours the previous day, before I got over it. 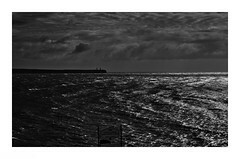 Sure the local temperature I’d been swimming in was higher and I hadn’t been training specifically for this swim, but I was as always swimming in the sea every weekend and I’d wanted to try this for a few years with no opportunity. I’d even had a sketchy swim only two weeks previously when a combination of wind strength and direction, swell and tide turned a 30 minute swim into a stern battle, that had been an appropriate training swim for this. I felt confident beforehand, nice and calm, no internals symptoms of anxiety that would elevate my heart rate and make me get cold quicker than normal. We all entered the water just after 10.10. The water was cold of course but nothing exceptional. No searing sinus pain, which tends to happen me when the temperature is six degrees or lower. Hands and feet were cold but not immediately on fire, no extreme gasping. All was good. 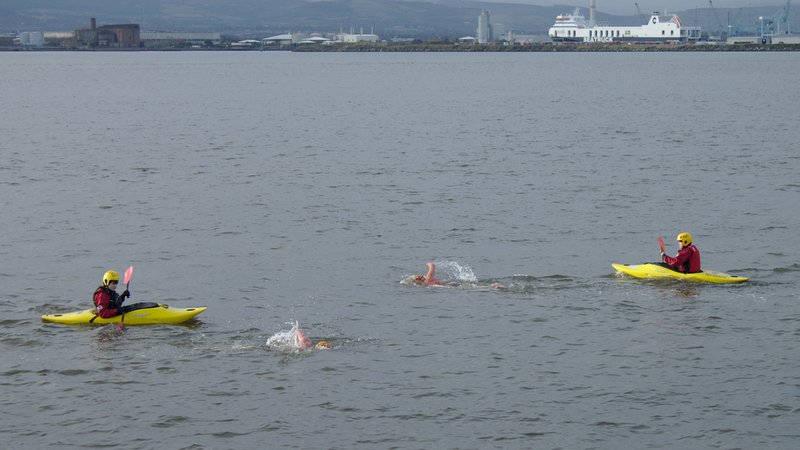 The group stroked off down the wall, Patrick out in front, Colm, a former national 400m champion, and probably one of the fastest open water swimmers in the country, quickly catching and passing the group. Fergal, Kennedy the novice, John and myself together in a group before Fergal and I went to the front of the four, and swam shoulder to shoulder for a couple of hundred metres. On the Bull wall there were plenty of people, volunteers and helpers and bemused morning walkers. I felt great, swimming nice and strongly, breathing only to my right instead of bilaterally, to allow me put a bit of extra effort in. When I swim by myself most winter weekends, I just cruise. I rarely swim for speed, except for the final few hundred metres sprint. This time, I had upped my tempo a bit. Fergal and separated and he swam closer toward the shore and we each had picked up separate Sea-Scout kayakers. The water was very murky and sandy and my watch wasn’t visible, so I hadn’t been able to check time for the first five minutes elapsed. I hadn’t even started to look for the Golf Club or turn flag, when I realised I had passed someone on the wall waving 25 or 50 metres, and had paid no attention. Now the kayaker was shouting at me, which of course I couldn’t hear with my ear plugs in. I’d swum right past the turn point. I stopped and checked with the kayaker, and turned back. That was fast! Fergal told me afterwards we’d reached the 800 metres turning point in less than 12 minutes. Now turned, everyone was in front of me, heading back to the shelter. My hands and feet were by now feeling painful, but not to the extent of the almost unbearable pain that occurs to me at around 5 degrees, the thermoceptors, the cold-receptors in my skin enervated but not quite overloaded. I paid no attention to trying to catch anyone, I wasn’t treating this as a race, just concentrated on swimming, in case I forgot how. 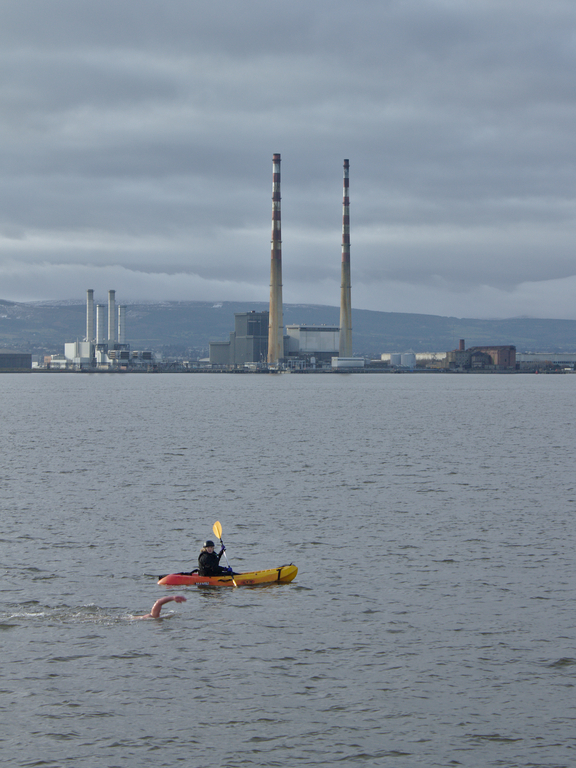 I was still breathing to my right so now I looking across the bay past the kayaker to the well-known twin chimney’s of the Pigeonhouse Power Station and the city and Wicklow Mountains beyond, the peaks still snow-covered after the foul weather all week. After a long period I decided on a forward position check. There was a changing shelter on the shore coming up. It wasn’t the larger one at the end of the wall that we’d started from, but there was another one a few hundred metres beyond, hopefully that would be the end. Head down again I swim on. Next check I had still not arrived at the next shelter. Another swim, another check. The shelter was clear but it wasn’t the end. What i hadn’t realised, and was only apparent afterwards when I looked at Google Earth, is that there are only three shelters along the wall. After the very quick first half returning toward the start was much slower, and just getting to the first of the three shelters, only 300 metres past the turn took almost as long as the first half of the swim. Usually you can feel when you are being slowed by a current, but when the location is new and the water is cold it’s not always apparent. 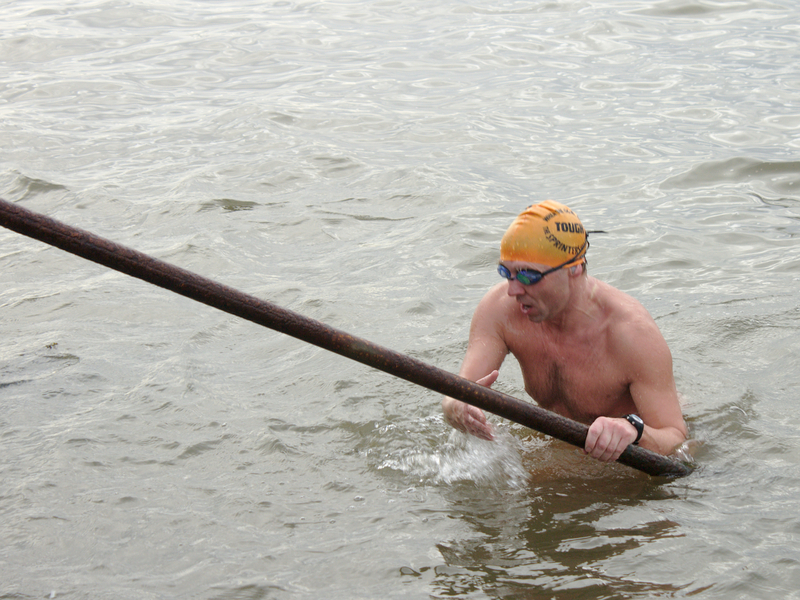 I still felt I was swimming quickly, but didn’t realise how much the incoming tide had slowed my return. 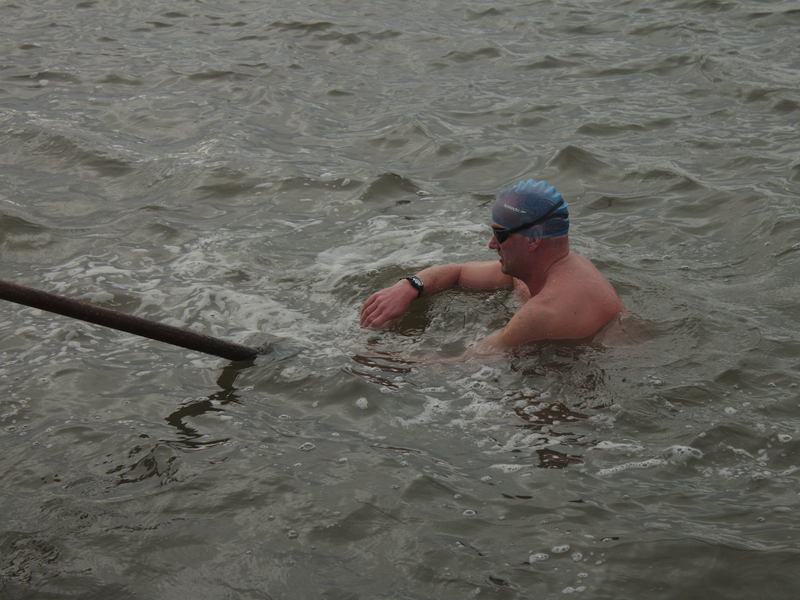 The swim continued as a plod onwards, hands and feet still painful but still manageable, fingers still in control. The last shelter finally became apparent, the white vinyl banner of Eastern bay Swim club on the railings visible. 300 metres, 200 metres. I engaged my kick a bit more strongly. Slow progress. My hands hadn’t Clawed, I didn’t feel blown. 150 metres. And then the strangest thing happened. I noticed what looked like black dots in the sky when I looked skyward on my breathing. Calling them black spots in front of my eyes would a bit too strong but very definitely noticeable and they were there for the final 100 metres. So I reached the railings, and exited the water. In Part Two, after the swim and post-swim analysis.